1. Arrange trial day at Elderday day Adult Day Program. This will provide Sally with some needed relief and a few hours to take care of her own personal needs. Although he has resisted the idea of being left at a center, Mr. Jefferson was willing to give it a try, when it was posed as a card group. On Tuesday and Thursday there is an active card group playing bridge. Mr. Jefferson is an avid bridge player. He had been apprehensive about being at this complex because it has a Nursing Home, along with Day programs, Assisting Living, apartments, memory center and a very busy activities calendar. One can come and go from the social program and participate in other activities within the complex. a. Interventions GCM to a arrange trial day at Elderday Adult Day Program. This will provide Sally with some needed relief and a few hours to take care of her own personal needs. Although Mr. Jefferson has resisted the idea of being left at a center, he was willing to give it a try, when it was posed as a card group. On Tuesday and Thursday there is an active card group playing bridge. Mr. Roosevelt is an avid Rummy player. He had been apprehensive about being at this complex because it has a Nursing Home, along with Day programs, Assisting Living, apartments, memory center and a very busy activities calendar. One can come and go from the social program and participate in other activities within the complex. b. GCM work with Sally to arrange Trial Day with program manager on a Tuesday or Thursday for cards. c. GCM to stop by while he is in Day Program, meet Sally for coffee to help her with her anxiety about leaving him. e. GCM follow up with Marsha Dowling MSE, Director o the Elderday Social Day Care program. Because the family and Mr. Jefferson and Sally want Sally to stay as Mr. Jefferson’s care provider you have crafted multiple intervention for respites and multiple sub interventions or steps to achieve that intervention, in this case respite. To create a care plan’s interventions to client’s problems you need a continuum of care. How do you find this continuum? As a geriatric care manager or aging professional, you should already have significant experience in this continuum before you open your door for business. 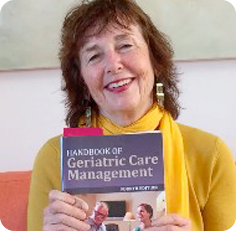 A core competence to open a geriatric care management business or any other aging related business is to know your need to know your community’s continuum of care from day one. As your care plan or the safety net you build or expand around your client web billows, expands, compresses, and changes constantly, you need the real Web to help you keep up. You can access most areas of the continuum of care and all its changes (new businesses, new senior services offered in part through the Internet. You can access your county’s or Area Agency on Aging Web site, which will usually list all the current senior services available in your town. Almost every county in the US has an area agency on aging and most have a web site that lists all the services available to seniors by category, such as nursing home, assisted living, home care agency, support groups, senior transportation etc.